Imprinting (or embossing) is a patterning technology that is used for the replication of micro- and nanostructures into a thin UV-curable resist; this way a pattern is created in the surface of this material (a topography). Roll-to-roll (R2R) imprinting is not new and is already used by several high tech companies for quite some time to create kilometers of textured film. 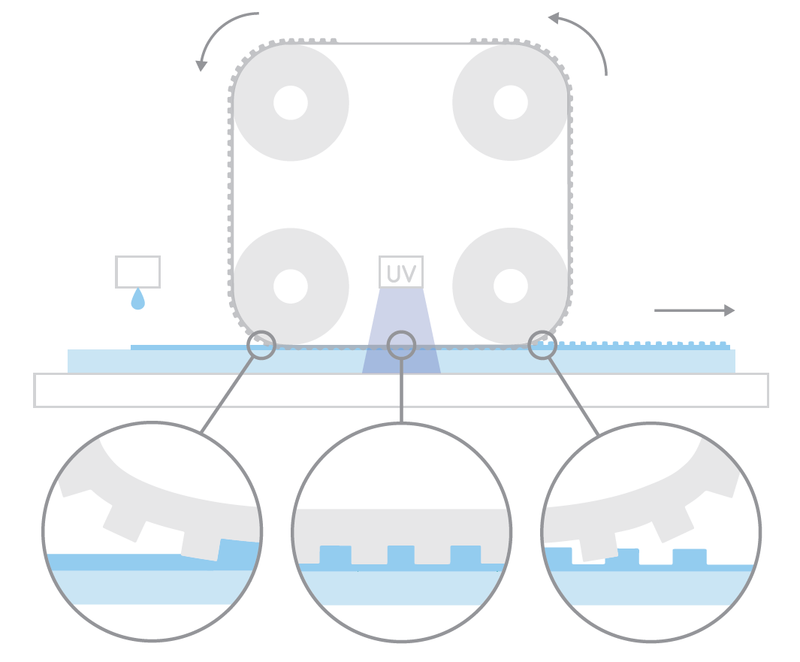 Also, small-size UV Nano Imprint Lithography (UV-NIL) is already available for imprinting of resists on wafers. However, these technologies do not offer a solution for the issues you have to deal with when applying micro- and nanopatterns on large-area rigid surfaces at a cost needed to enter targeted markets. Morphotonics has developed a unique roll-to-plate (R2P) nanoimprint technology, which is flexible and can be used for pilot- and mass production. The technology is cost-effective and due to the special properties of the flex stamps, it opens up a wide new range of product applications. 1. Our roll-to-plate imprint process uses a flexible stamp. This flexible stamp (also called soft mold or masterfilm) contains the inverse of the desired micro- or nanostructure. 2. After coating the substrate or stamp with the imprint material, the flex stamp is rolled onto the substrate with the UV curable imprint material in between. 3. The rolling movement ensures that no air is entrapped and also enables a line-contact of which the pressure can be controlled to achieve a certain layer thickness. Due to its flexibility the stamp can deal with surface irregularities and uneven substrates. 4. After UV curing through the stamp, the stamp is delaminated. Thanks to its flexibility, the separation of the stamp from the imprinted substrate is very easy. After separation the stamp reused to imprint the next substrate. The stamp can be reused more than 1000 times making this a very cost effective process. Structures with dimensions from 500 micrometer down to 50 nanometer can be imprinted with the Morphotonics technology. Roll-to-plate nanoimprint lithography enables the application of micro- and nanopatterns onto very large area products. Nanostructured layers are key in improving the performance of various products. Solar, display and lighting panels in particular benefit from these layers. Morphotonics focuses on direct imprinting of these layers on planar substrates and products. The innovative roll-to-plate imprint technology enables high quality structured layers on glass and glass-based devices at the lowest cost possible. In addition to glass, also polymer or metal plates and sheets can be imprinted with this technology. With the Morphotonics technology the structured layer consists of only one material in a single layer. When used as a permanent layer, this approach opens markets where multi-layered structured films (foils) cannot be used. Roll-to-plate imprinted layers excel in outdoor stability, optical properties and high temperature applications. When the structured layer is used as an etch mask, Morphotonics’ technology enables patterning the underlying substrate at unprecedented large areas. 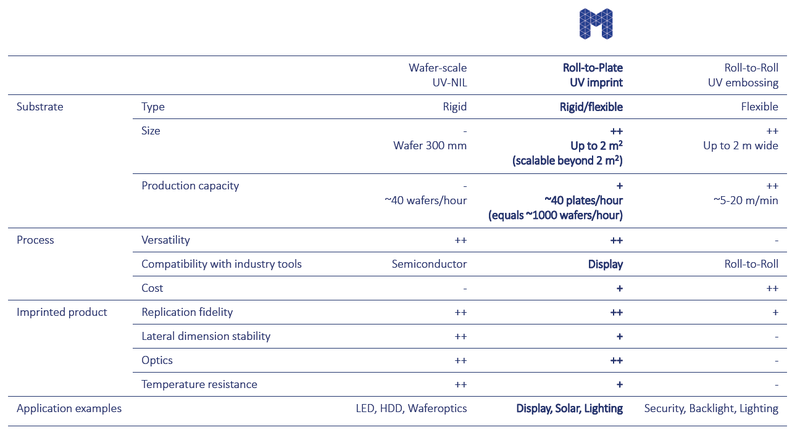 Morphotonics’ roll-to-plate nanoimprint technology combines the high-end capabilities of wafer-scale UV-NIL with throughputs that can compete with roll-to-roll technologies. Especially applications that cannot be produced cost-effectively on wafer scale or are larger than a wafer benefit from our technology. With our state-of-the-art nanoimprint equipment, engineered flex stamps and optimized imprint materials, we can offer a turn-key solution. If the imprinted layer is used as a permanent layer it offers better optical performance, durability and thermal stability compared to film-based solutions. When the patterned layer is used as etch mask, our technology can easily apply features below 1 micrometer, something which is not possible with large area photolithography tools today.